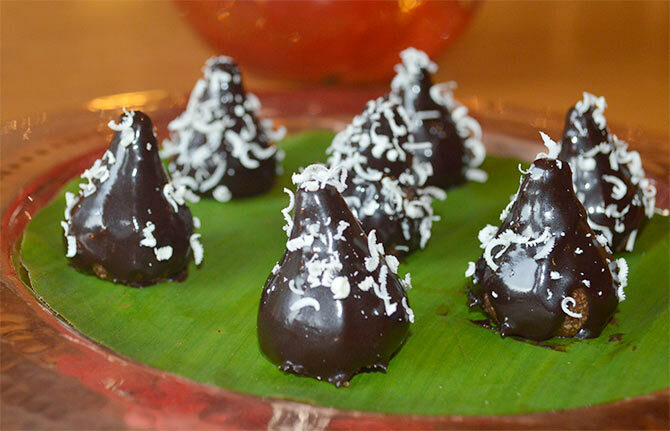 Wow your guests with these delicious modak preparations. With the 10-day Ganpati festival round the corner, it is time to welcome Lord Ganesha and offer him his favourite modaks. 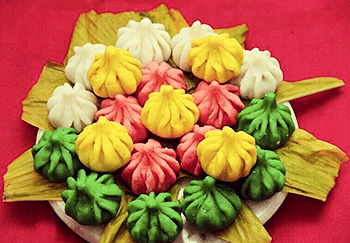 Hatwalaniche Ukadiche Modak is something everyone enjoys during the festival. It is either made at home or purchased from shops. While the traditional ones are a must-have, today there are interesting variations too, to cater to different taste buds. Dry fruits, mascarpone cheese, peanut ****er, fruit compote, nutella and salted caramel are some of the ingredients combined to make avant-garde and exotic modaks. 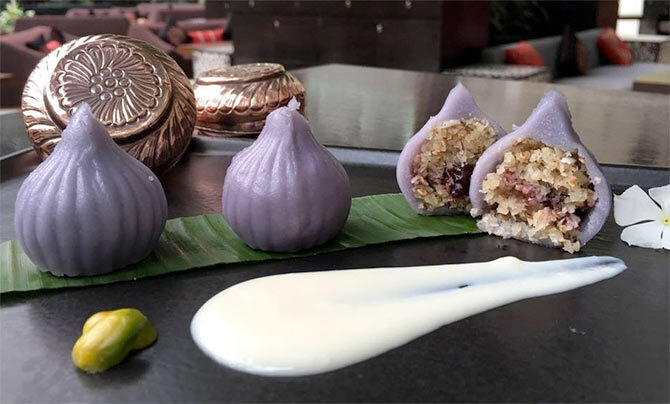 Mini Ribeiro gets five chefs from Mumbai to share unusual modak recipes that can be prepared at home. Not a huge fan of unusual modaks? Then this recipe is for you! Mix coconut and powdered sugar in a bowl. Add milk and keep aside for a minute. Add roasted poppy seeds, desiccated coconut and the sugar and coconut mixture. Stir on a low flame until the mixture turns golden brown. Add cardamom powder, powdered dry dates, saffron strands mixed in milk and chopped roasted dry fruits. Put off the flame off and add gulkand. Boil one and half cup of water with salt and oil in a pan. Reduce the heat and add rice flour slowly. Stir is continuously to prevent lumps from forming. Cook for three minutes until all the water is absorbed and the rice flour is cooked. Switch off the gas and keep the pan covered aside for four minutes. Take all the dough in a plate and begin to knead it. Remember the dough will be hot, so apply water on your palm before you knead it. If the dough looks hard or dry to you, add a few more teaspoons of warm water and continue to knead. 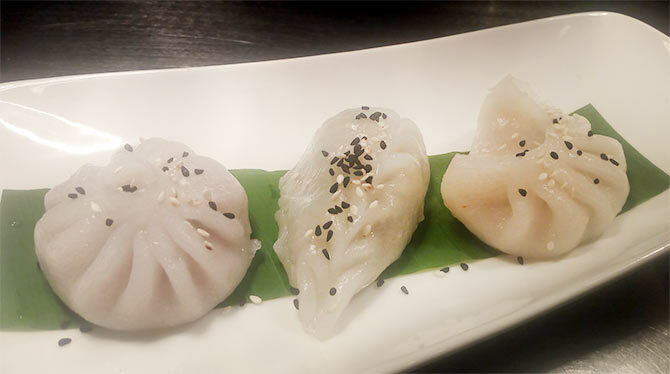 Divide the modak dough into three equal portions. Mix green food colour with one part and orange colour with another part. Keep them covered under a damp cloth. 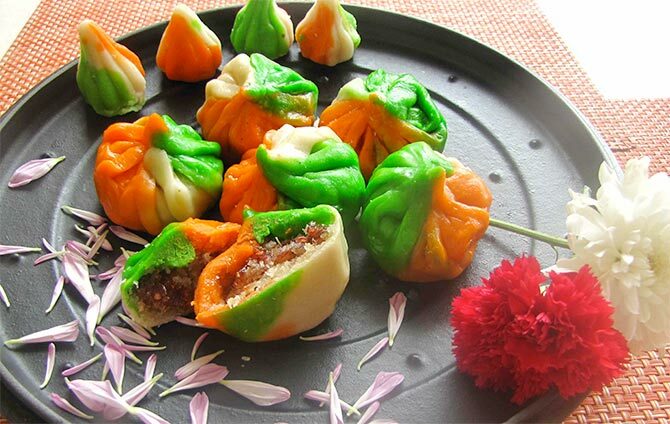 Make small, equal number of balls from white, green and orange dough. Take each of the three colour balls and place next to each other. Press them with your palms to form one single disc resembling a three-petal flower. Roll out the disc to a two to three inch diameter circle with a rolling pin. Spoon some stuffing at the centre of the disc. Gather the periphery at the top and join to form a peak. The pleated shape looks like a whole garlic. Remove excess point of the peak and make it pointed. Make all the modaks in this way and keep them in a steamer pan. Cover the pan and steam on low flame for 10 to 15 minutes. Switch off and serve warm with ghee. IMAGE: Recipe by sr. sous chef Mohan Patil, Hotel Marine Plaza, Mumbai. Boil water and add oil in it for the outer covering. Take it off heat. Add rice flour, little by little to avoid lumps. Cover the mixture and let it cool. When it's cool, knead it well into dough with a smooth finish in such a way that it should sparkle. Wash the chana dal well under cold running water. Once done, soak for 60 to 90 minutes. Drain the soaking water and discard. Place the dal in a pressure cooker with fresh two and a half cups of water. Cook the dal for four whistles. When done, drain the water in the dal through a sieve. Press the dal lightly, so that all the water drains out through the sieve and dal gets mashed a bit. Make balls with the dough for the covering. Place the stuffing in it. Cover it completely with the dough. Steam cook the modaks in a cooker for 15 minutes until done. Serve. IMAGE: Recipe by executive sous chef Sanjeev, The Lalit, Mumbai. Take mawa, milk and sugar in a food processor or mixer jar. Blend to make it soft. In a heavy bottom pan, add this soft mixture and cook it on low flame. Let it melt and thicken. Once done, remove it from flame. Bring it to room temperature. Add cocoa powder in it. Mix it well. Add dark chocolate chips. Keep it aside for cooling. Grease the modak mould with ghee, as this will prevent the chocolate truffle mixture from sticking. Fill the chocolate truffle mixture inside the mould and stuff it with tempered white chocolate in the center. Press it nicely using your fingers and demould. Remember to grease the modak mould before use. You can also coat it with chocolate truffle. Keep it aside to cool. Garnish with chocolate flakes. Serve. Make stiff dough with salt and very hot water. Keep aside to rest for an hour. Cook the mawa and sugar together in a pan on low flame. Stir continuously, until the sugar dissolves completely. Add cardamom powder and crumbled motichoor laddo. Mix well. Once done, remove from heat and set aside to cool it to room temperature. Divide the dough into 24 parts. Roll each portion into thin circles. Bring all the sides together and shape it like a pouch. Place it on a banana leaf. Garnish it with roasted sesame seeds. Serve hot. Note: You can make this in the regular shape of modaks or try any other shape as desired. IMAGE: Recipe by executive chef Salil Fadnis, Sahara Star, Mumbai. Cook sugar and frozen blueberry in a heated pan, until sugar is dissolve and and the mixture has thickened. Lightly roast the khus khus in a pan. Add coconut and keep cooking on a very low flame. After a minute, add jaggery. Allow the jaggery to melt. Once done, cook till the mixture forms into one mass and is dry. Sprinkle cardamom powder and salt. Mix evenly. Boil water and slowly add it to the bowl of rice flour. Mix roughly with a wooden spoon. Cover and keep the bowl aside until the dough cools down to a stage when you can comfortably handle it. Add the colour and knead to form a soft pliable dough. Cover it. Take shrikhand and add milk. Stir until it turns into a smooth but thick sauce. 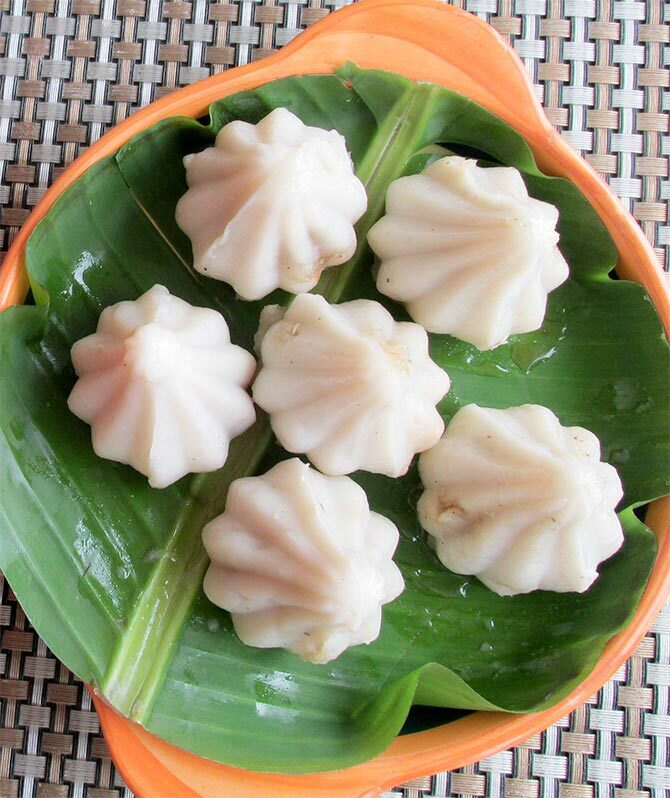 Apply a few drops of oil to the modak mould. Make a small ball of the dough. Press against the insides of the mould to completely cover it. Stuff it with blueberry filling and the lemon coconut filling. Press it in well. Make another small ball, flatten it with hands and cover the base of the modak and seal. Steam cook for about 10 minutes. Serve it with shrikhand sauce. You can send us your favourite recipes too. Write in to us at getahead@rediff.co.in (subject: Recipe) with your name, hometown and any interesting details about the origin of the recipe, along with a photograph if possible. We'll publish the best preparations right here on Rediff.com and in India Abroad.